Imagine having a hunting backpack that’s compact and light enough to allow jog, climb or even sprint. Imagine this backpack having the capacity to bear as much gear as you would possibly need. Now, there’s no need to imagine because the masters of hunting backpacks, ALPS Outdoor Z have designed and manufactured a pack that can handle the unpredictable hunting life. The Pursuit is what it’s called and, just like its name, it’s meant for the pursuit of the game without slowing a hunter down. This backpack is perfect for day’s hunting trip. It’s comfortable to carry and is easy to maneuver in the wild with. And it comes at a highly affordable price. Still, its gentle looking nature conceals its gritty and rugged personality. This is a pack with hunting pedigree and was made especially for the wild. And when faced with the brutality of the outdoors, this pack will take whatever punishment is dished out to it and remain stoic. 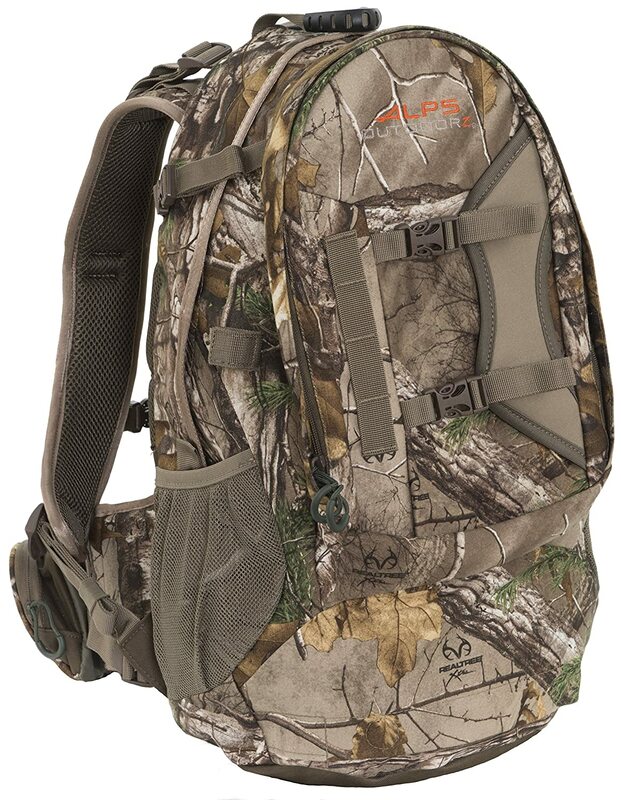 All right people, let’s dive right into the ALPS OutdoorZ Pursuit Hunting Backpack Review. Its size, its weight, its very demeanor is meant for a day’s hunting adventure. However, that doesn’t stop it from trying to push its carrying limits. And it does. The pack has some pockets for storage including a large front pocket together with an equally ample main pocket. It also has lower side mesh pockets and a padded waist belt with two pockets. All these grant you a total carrying capacity of an amazing 2700 cubic inches. If there isn’t enough room on the inside, you can still lash extra gear on the outside thanks to the webbing loops on the front face. There should most certainly be enough room for carrying all your gear and more. The one feature that sets apart a normal backpack from a hunting backpack is the weapons carrying system. This is what gives these packs the soul of a warrior. It’s what defines a true hunting pack. And the ALPS OutdoorZ Pursuit shows this intent. It was made for the hunter who prefers the use of a bow and arrows. But that isn’t all. It was also made for the rifle hunter. In short, this backpack has a versatile personality that’s ideal for all hunters. On either side of the pack, there’s a quiver holder. The placement of this enables you to easily reach your arrows without the need to take off the backpack or to even turn around to search for them. Additionally, there’s a drop down pocket in which a rifle or bow can comfortably sit. This too puts the weapons within reach allowing for a quick draw. Durability is a quality that defines an excellent bow hunting pack. The Outdoor Z Pursuit sits right up there among the best. Clad in the Brushed Realtree Xtra HD fabric, the backpack is endowed with a hard wearing quality. This fabric doesn’t easily tear. In the face of numerous tree branches and bushes that might cause damage to the backpack, the fabric withstands this brutality allowing the backpack to remain in good condition. The color gives the pack and, by extension, you a much-needed camouflage. It easily blends into the environment hiding you from the animals. In case it starts raining, there is a blaze orange rain cover included. Simply pull it out and lay it over the backpack to keep the rain from entering the pack. This backpack has your best interests at heart. That’s why built into it is a hydration pocket in which you can insert a water reservoir of 2 liters. As you’re walking on, you’ll have little time to take off the backpack and reach for a water bottle. That’s why, through the hydration port, you can pass a bladder that’s connected to the reservoir. The confidence you’ll have in your best hunting backpack depends on the confidence the manufacturers themselves have in their product. And a warranty is what communicates that level of confidence. If you get a one year warranty that tells you at least, the manufacturers know it can last a year. A two-year warranty gives you a greater amount of confidence. What about a lifetime warranty? This shows us that the backpack is designed to serve you throughout your life. And ALPS outdoorz pursuit are so confident in their backpacks that they offer support for a lifetime. The design, the workmanship, the build quality, it all screams quality. The OutdoorZ Pursuit should indeed last a lifetime. The Pursuit backpack is lightweight, weighing in at only 4 pounds. It has a carrying capacity of 2700 cubic inches. The backpack has an elaborate system of pockets ranging from the large main pocket to the organizational shelf pocket. This gives enough storage room. In case the inside is full, more gear can be lashed onto the outside on the webbing loops. With a hydration pocket and port, you can store water to keep you hydrated throughout the expedition. Made of the Brushed Realtree Xtra HD Fabric, the backpack is resistant to scratches making it highly durable. It comes with an orange rain cover for protection from the rain. The ALPS OutdoorZ Pursuit is ideal for both gun and bow hunters. The drop down pocket can easily fit a rifle or a bow, and the side quiver holders place your arrows within reach. The backpack doesn’t have a frame for better stability. Q: Is the fabric quiet? A: Yes it’s very quiet. You can be able to get pull out your weapon without making a sound. Q: What material is the frame made of? A: Unfortunately this pack doesn’t have a frame. A: It measures 20 inches by 14 inches by 14 inches. Q: Is there a center aluminum stay? A: Yes, there’s a sturdy aluminum remain in the Pursuit. A: The backpack itself isn’t waterproof, but it comes with a cover that is. If you’re looking for a backup hunting pack to carry for a day’s hunting trip, then this is the perfect option. Perhaps you’re camping and need a smaller backpack to carry away from the base. No doubt, the Pursuit is perfect. It bears all the great qualities of the hunting bags. From durability to carrying capacity, it doesn’t fail to impress. Sure, there is no frame, but this is a daypack. In any case, the padded shoulder straps and waist belt make carrying it comfortable enough. The ALPS OutdoorZ Pursuit Hunting Back Pack earns itself two thumbs up.